14.2 million people in poverty in the UK, 6.9 million (48.3%) are living in families with a disabled person. 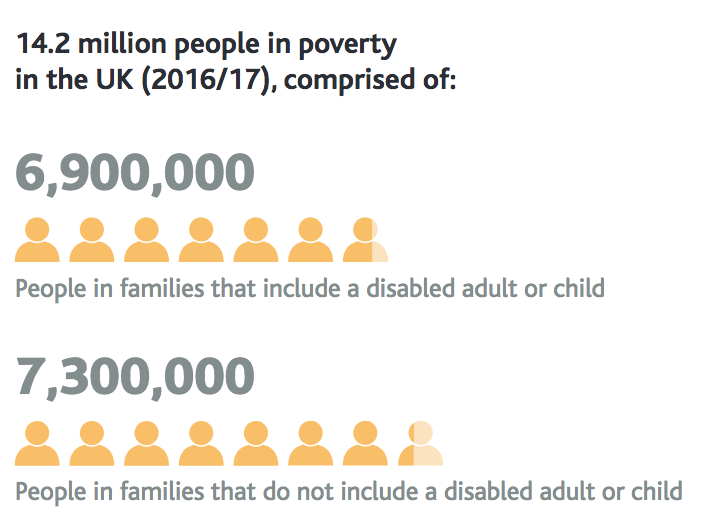 Given that only 35% of families in the UK have someone with a disability, this shows that families with someone with a disability are significantly over- represented within the population in poverty. Poverty rates also vary across people in families with different disability statuses. The poverty rate for people living in a family with a disabled adult or child stands at 27.6%, whereas for people living in a family where no-one is disabled, the poverty rate is 16.3%. 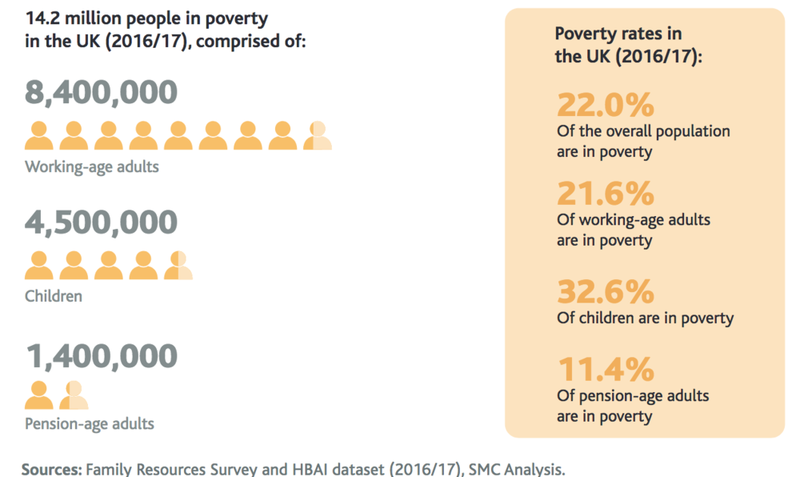 The SMC measure of poverty suggests that 22.0% of the UK population is living in a family considered to be in poverty. Poverty rates for children are far higher (32.6%) than those for working-age adults (21.6%) and pension-age adults (11.4%). This means that there are 14.2m people in poverty in the UK, comprised of 8.4m working-age adults, 4.5m children and 1.4m adults of pension age. There has been much debate on poverty measures with no agreed upon UK metrics. The Socail Metrics Commission has taken thinkers (from both left and right) to look at metrics and this seems very robust to me. The figures are more severe than I would have guessed. I think this might be suggestive of austerity not working well for thos ein poverty although the policy and structural factors are complex. This seems to be view the view of a recent UN inspector visit.